Melanoma, most dangerous form of skin cancer, develops in the cells (melanocytes) that produce melanin, the pigment that gives skin its color. These tumors originate in the pigment-producing melanocytes in the basal layer of the epidermis. Melanomas often resemble moles, some develop from moles. The majority of melanomas are black or brown, but they can also be skin-colored, pink, red, purple, blue or white. Melanoma can also form in eyes and, rarely, in internal organs, such as intestines. The exact cause of all melanomas isn’t clear, but exposure to ultraviolet (UV) radiation from sunlight or tanning lamps and beds increases risk of developing melanoma. Limiting exposure to UV radiation can help reduce risk of melanoma. Melanomas can develop anywhere on the body. They most often develop in areas that have had exposure to the sun, such as back, legs, arms and face. Melanomas can also occur in areas that don’t receive much sun exposure, such as the soles of feet, palms of hands and fingernail beds. These hidden melanomas are more common in people with darker skin. If a patient is analyzed with a melanoma, examine all lymph node groups. A light complexion, light eyes, blond or red hair, the occurrence of blistering sunburns in childhood, heavy freckling, and a tendency to tan poorly and sunburn easily indicate increased risk for melanoma. Melanoma occurs when something goes awry in the melanin-producing cells (melanocytes) that give color to skin. Normally, skin cells develop in a controlled and orderly way, healthy new cells push older cells toward skin’s surface, where they die and eventually fall off. But some cells develop DNA damage, new cells may begin to grow out of control and can eventually form a mass of cancerous cells. What damages DNA in skin cells and how this leads to melanoma isn’t clear yet. It’s likely: a combination of factors, including environmental and genetic factors, causes melanoma. Still, doctors believe exposure to ultraviolet (UV) radiation from the sun and from tanning lamps and beds is the leading cause of melanoma. UV light doesn’t cause all melanomas, especially those that occur in places on body that don’t receive exposure to sunlight. This indicates that other factors may contribute to risk of melanoma. The best treatment for depends on the size and stage of cancer, overall health, and personal preferences. Treating early-stage melanomas: Treatment for early-stage melanomas usually includes surgery to remove the melanoma. A very thin melanoma may be removed entirely during the biopsy and require no further treatment. Otherwise, surgeon will remove the cancer as well as a border of normal skin and a layer of tissue beneath the skin. Surgery to remove affected lymph nodes: If melanoma has spread to nearby lymph nodes, surgeon may remove the affected nodes. Additional treatments before or after surgery also may be recommended. Carboplatin and paclitaxel (sometimes combined with sorafenib). Radiation therapy: This treatment uses high-powered energy beams, such as X-rays, to kill cancer cells. Radiation therapy may be recommended after surgery to remove the lymph nodes. It’s sometimes used to help relieve symptoms of melanoma that has spread to another area of the body. Biological therapy: Biological therapy boosts immune system to help body fight cancer. Biological therapies used to treat melanoma include interferon and interleukin-2, ipilimumab (Yervoy), nivolumab (Opdivo), and pembrolizumab (Keytruda). Targeted therapy: Targeted therapy uses medications designed to target specific vulnerabilities in cancer cells. 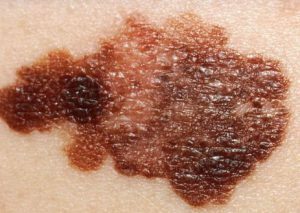 Vemurafenib (Zelboraf), dabrafenib (Tafinlar) and trametinib (Mekinist) are targeted therapy drugs used to treat advanced melanoma. These drugs are only effective if cancer cells have a certain genetic mutation. Cells from melanoma can be tested to see whether these medications may help. Make an appointment with doctor if notice any skin changes that seem unusual.